Our northern neighbors are disproportionately polite on Twitter. You’ve heard the stereotype: Canadians, bless ’em, are the politest of people. When we Americans think about (ah-boot?) our neighbors to the north, we often think they profusely apologize, don’t commit crimes, and lay off honking their horns in traffic. Even still, research has shown this stereotype about Canadian behavior is false, and there is actually no discernible difference between Americans’ and Canadians’ personalities. But now, new research reflects our biases: Canadians are disproportionately politer than Americans on Twitter. A group of Canadian linguists from McMaster University published a study Wednesday in the journal PLOS ONE that shows Canadians disproportionately use polite and positive language on the social media platform, while American tweets are characterized by negative words and profanity. The researchers collected 40 million tweets from both Canadian and American accounts between February 2015 and February 2016—note, before our Tweeter-in-Chief took the Oval—and used statistical analysis to find words tweeted disproportionately more or less by individuals from each nation. They discovered words over-represented in Canadian tweets were largely positive, and by contrast, words over-represented in American tweets were largely negative. While it’s unclear what came first—the stereotype or the language—the authors argue language employed by the countries could be reinforcing our long-held beliefs about them. The group’s findings, Snefjella says, were somewhat of a lucky accident. The team was initially interested in investigating differences in Canadian and American dialects (for example, using the word pop versus soda), but what emerged from the data wasn’t what they expected. 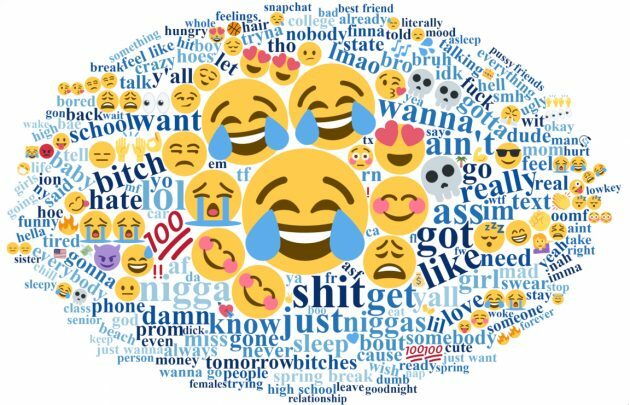 Americans, they found, tended to tweet disproportionately more emojis (especially negative ones), swear words, and racial slurs, as well as emotionally charged, negative words. Some of the words “most characteristic” of Americans include hate, miss, tired, mad, and ugly—but also money, hair, and high. The top 250 American words. The larger the word, the more over-represented it is in American tweets. 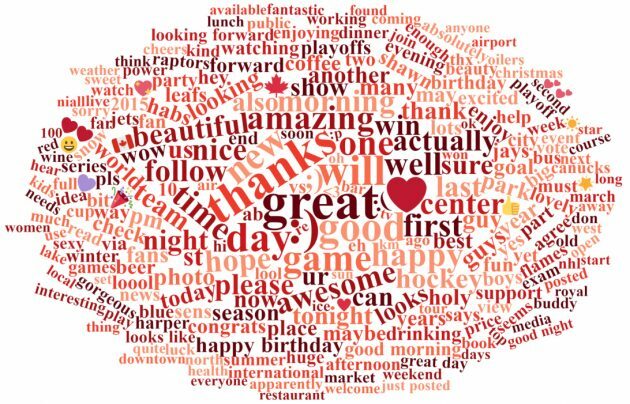 Canadians, on the other hand, tend to favor emoticons—:) or ;)—with the exception of the purple heart emoji (💜) and maple leaf (🍁) and saw an over-representation of emotionally positive words like great, thanks, amazing, beautiful, and happy, in addition to neutral words like coffee, winter, hockey, beer, and party. The top 250 Canadian words. The larger the word, the more over-represented it is in Canadian tweets. Just for fun, here are two short sentences I put together using only the most characteristic American words: Im really bored, dude. Beach tomorrow? And here’s one with only the Canadian words: Happy birthday, guys. Enjoy ur beautiful evening. To be clear: The vast majority of words (99.66 percent) tweeted by Americans and our neighbors were not used in consistently different ways. After all, we largely speak the same language. But relative to each other, some words stuck out as being “more characteristic” of Canadians and vice versa—and those words mirrored national stereotypes. “We aren’t saying, Americans aren’t nice, so they don’t talk nice, and Canadians are nice, so they talk nice,” says Snefjella. “That is exactly what we aren’t saying.” Rather, the result may provide a clue as to why the stereotype exists in the first place.